On Saturday, I was summoned by a friend to assist in finding a dress for a wedding she was attending. Following the shopping expedition, my friend had to run off to catch a flight. As I walked back to the car I found myself becoming increasingly hungry, so I took a detour down St Christopher’s Place and was attracted to a sign saying ‘Two Courses for £8.50’. 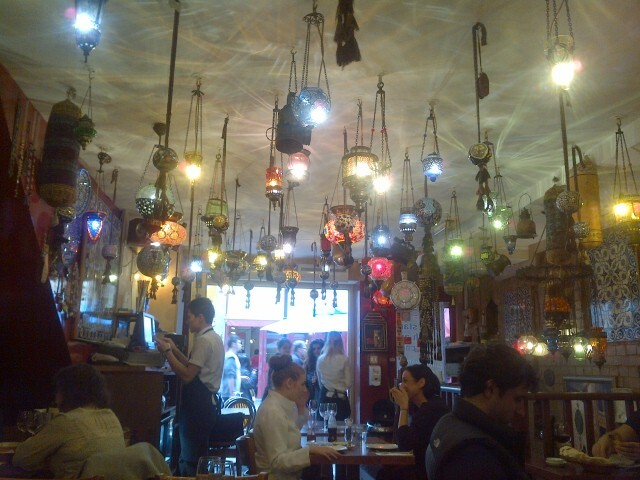 I was handed the menu and given a few minutes to decide if I wished to proceed into the restaurant that resembled a little shop we found in the middle of the Moroccon Souk with dozens of lamps hung from the ceiling. I took up the offer and was quickly shown to a table and asked if I wanted anything to drink. I was then left to mull over the menu whilst taking in my surroundings. Having decided on what to eat, it took a little while to get the waiters attention to order my food but having done so, I sat back and waited for it to arrive. The place was pretty busy with only a few tables to spare but this was expected given the vast menu which included everything from pizza and pasta to grilled fish and mezze, definitely something to please everyone. My starter arrived and whilst remembering to take a photo for my lovely readers I noticed the guy on the next table was looking at me in a slightly odd fashion. Once I’d taken the photo I felt it necessary to proclaim that I do indeed have a food blog and that the photos were for that. Id ordered Kisir for my starter, which is a mix of wheat, parsley and tomato paste and was described on the menu as containing nuts and also took the waitress up on the offer of the ‘Special Bread’. 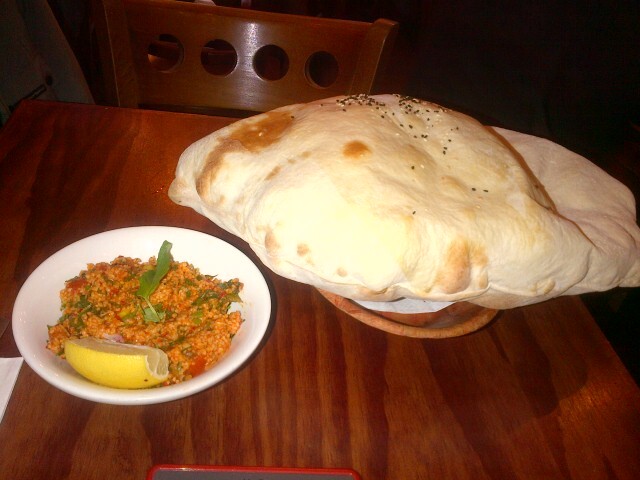 As you can probably guess, I was slightly alarmed by the size of the bread, although the picture doesn’t show it to its full potential, but I was also slightly disappointed to find that there were no nuts in my Kisir. Whist the flavours were good, it was pretty much just a couscous salad but the addition of the tomato paste made it more of a mush and a rather filling mush at that. Ok ok i’m being a little critical, as I said the flavours were good but the addition of nuts would have added to the texture making it a bit nicer to eat. I have to say, the portion was an extremely good size given the fact that I was promised two courses for £8.50 and as I looked around I found this to be the case with all the food coming out of the kitchen. 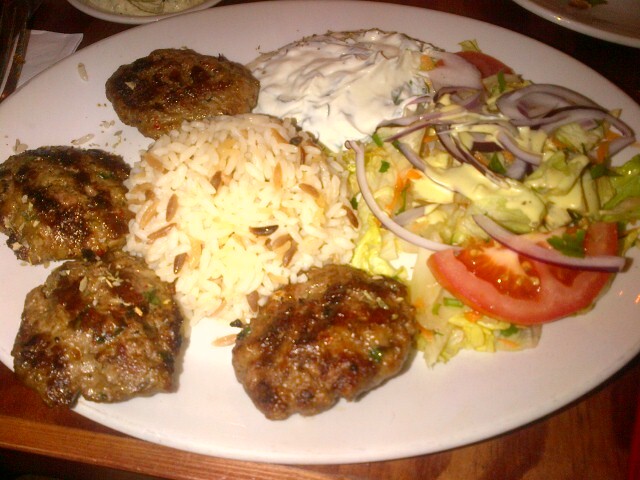 The Kofte’s were soft and succulent with a slight pinkness in the centre. The flavours were also good, although I couldn’t see any sign of parsley/tomato/onion as is usually seen in Turkish Kofte’s. As is evident from the picture, the Kofte was served with a salad, a sauce that tasted a bit like Tzatziki but with more yoghurt and what both myself and the couple on the next table agreed must be microwaved rice. I made my way through 3 Kofte’s before I gave up on the food and shifted to drinking Mint tea. 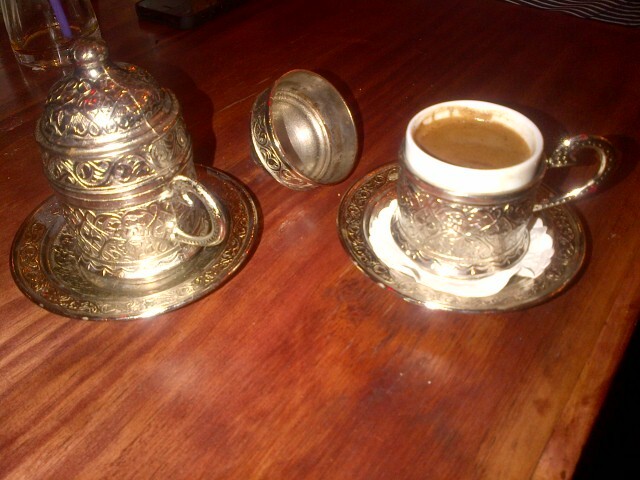 My fellow diners went on to order Turkish Coffee which was served in quite a quirky (possibly über traditional) way and so insisted that I take a picture for my blog! Whilst I can’t comment on the coffee, the general consensus from my lunch buddies was that it was very smooth. Something I did learn was that you can tell which coffee is more sweet by how much the foam shines – sounds nuts but it is true! With the mint tea included my bill came to £12.50. I don’t usually mention how much I spent but the fact that I had two decent sized portions and mint tea on a Saturday afternoon, I was truly impressed by this little Aladdin’s Cave. I have to say , I think this is one of those places that’s perfect for a casual lunch, somewhere I might well go back to visit again!